Everyone’s injured a muscle at least once in their life. Stretching for that ball you couldn’t reach, amusing the kids with amateur acrobatics, sleeping at a funny angle, sneezing too hard. Some pulled muscles, such as neck cricks, are just uncomfy; while some, like lower back injuries, debilitate your natural movement for days. Pulled muscles are usually caused by a sudden movement that the muscle was unprepared for. This is why sports people go through a warm-up before they play; it helps to prepare the muscle. When you do pull a muscle you might experience an initial sharp pain followed by soreness, bruising and stiffness, accompanied by inhibited movement and even muscle spasms. These are a few of the symptoms that frustrate and cause discomfort if not treated. So, how do you stop the pain? What do you do when you pull a muscle? Is it heat or ice? Is it rest or movement? Is it bad enough for a physio or should I treat it myself? You should start by assessing its severity. If it feels particularly bad then consult a professional. It’s important not to underestimate pulled muscles; if you can’t walk or if you can’t move your neck at all, you should see a physiotherapist as soon as possible. For pulled muscles that are less severe, where you can still make some movements, it’s possible to administer treatment to yourself in order to diminish the symptoms. The first and, perhaps worst, mistake anyone makes when they pull a muscle, especially when playing sport, is to keep doing whatever you’re doing and not stop. A pulled muscle needs rest. If you keep using your muscle excessively you will only make the injury worse. And the other letters might not work so well for you. That elemental question, fire or ice? Well, for starters the answer is ice. And the quicker the better. A bag of peas is a favourite but anything sufficiently cold will do. Wrap it in a tea towel, or some other fabric, to avoid an ice burn to the skin and hold it over the strain at 20 minute intervals. 20 mins on. 20 min off. Do this 3 times. This will act as an analgesic, relieving some of the pain, but the main purpose is to reduce swelling. Compression is about support of the muscle. When you’ve finished applying the ice, you should tie a bandage round the affected area. Don’t make it too tight as this could restrict the blood flow. But make sure it applies a comfortable amount of pressure. As well as support this will reduce further swelling. Elevation is about the blood flow around the muscle strain. It’s not always practical but you should lift the affected body area above the heart, or at least sit with your leg up on the sofa or a footstool. 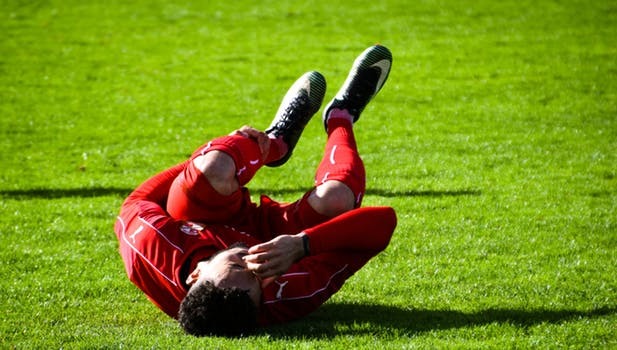 This can help reduce the swelling and make the injury to heal more quickly. After performing RICE over the first 24 hours it’s advisable to get the muscle moving again as soon as comfortable. The next day isn’t too early for some muscle pulls, but only make movements that do not cause pain. If you feel pain then stop immediately and rest some more. Though you might not perceive it’s healing qualities having much of an effect, this natural remedy does ease the symptoms of a pulled muscle and gives aid to recovery. For that you should put it into practice. At this stage you will be ready for treatment with me. I will be able to assess the damage and the recovery options as to weather you need osteopathy, scalp acupuncture or balance acupuncture.